Hey! Remember that time I finished a book challenge?! Every time, I swear I'll finish. I polish off 4-5 books per month and am right on track to not only finish, but read a few extra books as well. And then every time, I choke. I lose my reading stamina and I fall 1-2 books short of completing my challenge. Every. Single. Time. 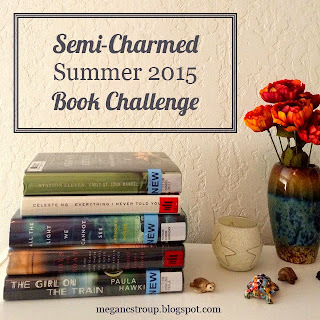 July kicked off Erin's Book Challenge! Although Erin is also a blogger and another self-described book challenge addict, her challenge format is Facebook-based and really interactive which I love. She also maintains albums of the all the different books picked so members of the group can go in at any point and see how books have been rated by other challenge participants. If you're interested in joining another book challenge, hers is a good one! So, what exactly did I read? Nothing. I listened to the audiobook version of Harry Potter and the Half-Blood Prince and thus concludes my literary accomplishments for the last month. I suppose I could technically count it for the "Book with a Kickass Female Character" for the Literary Ladies challenge, because Hermione. Duh. But it wouldn't actually help me complete the challenge, so I'm giving my self a big, fat stamp of failure. Next time, book challenge. Next time.